Barry Hearn, who promotes IBF, IBO, WBA, WBO heavyweight champion Anthony Joshua, says there is no problem with matching his boxer against any of the top fighters in the division. Joshua is slated to return on April 13th at Wembley Stadium in London. 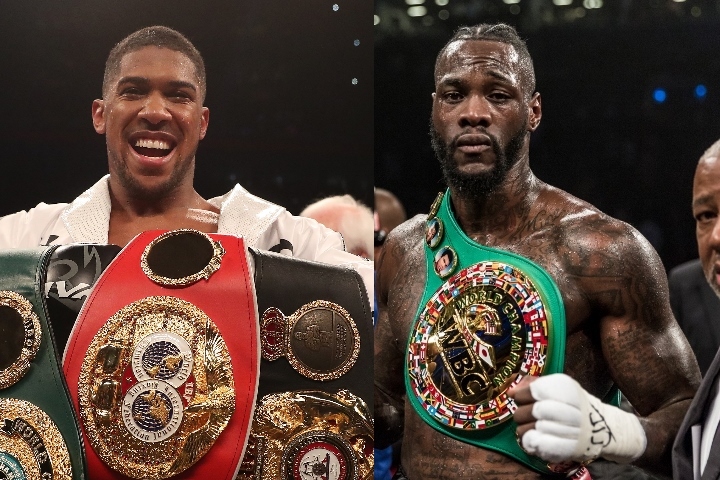 The biggest fight for Joshua is a unification with WBC heavyweight champion Deontay Wilder (40-0, 39 KOs). Wilder is likely heading to a rematch with Tyson Fury in the coming months. Last month, the two heavyweights fought to a controversial twelve round split draw at Staples Center in Los Angeles, California. According to the elder Hearn, Joshua would face either boxer in April – confident of Joshua’s ability to beat either fighter. “I’d be very happy to fight Tyson Fury on April 13th as well. And the reason being… Tyson Fury can box but he can’t punch, Deontay Wilder can punch but he can’t box, AJ can punch and he can box,” Hearn told Love Sport Radio’s The Brian Moore Show. Although Hearn admits it would be much tougher to make the fight with Fury, who is aligned with a rival promoter in Frank Warren and a rival UK network in BT Sport. “It is a big fight. It’s complicated because Tyson Fury’s on BT, we’re on Sky,” Hearn added. “Tyson Fury’s promoted by Frank Warren, we are obviously the market leaders and industry leaders so there’s all sorts of egos and money coming in. If there is no Wilder or Fury – then Hearn views Dillian Whyte and Jarrell Miller as the most likely options. “If those two are not coming to the party quickly I would imagine that Eddie is looking at Jarrell Miller in New York as a Madison Square Garden debut for AJ would be commercially very solid, and then Dillian Whyte who I think is pound for pound the most dangerous heavyweight out there,” Hearn said.